Buses carrying thousands of Christian pilgrims descended upon Qasr el-Yahud on the first Sunday in January. They had arrived at that spot – the banks of the Jordan River, where Jesus was baptized, according to religious tradition – from near and far, from Italy and Ramle, Nazareth and France, Bethlehem and the Galilee, but mainly from the nearby city of Jericho. The thousands of Catholics and Protestant pilgrims got off the buses near the monastery of St. John the Baptist, and from there walked about a kilometer (approximately half a mile) in a long procession led by hundreds of brown-robed priests. Many of them sang. 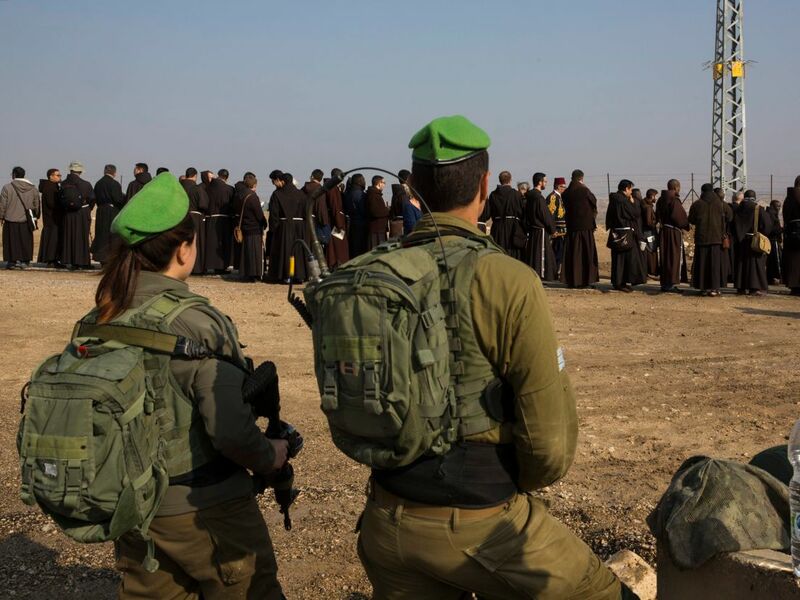 At the head of the procession were Father Francesco Patton, the Franciscan leader who holds the title of Custos – the Roman Catholic Church’s chief custodian of the Holy Land – and Lt. Col. Azhar Ghanem, head of the Israel Defense Forces Liaison Office in Jericho and the Jordan Valley. Dozens of female soldiers in flak jackets secured the area. The history of Qasr el-Yahud is amazing, but the site itself is extremely problematic. The main question is why the whole area, encompassing no fewer than seven ancient and fascinating monasteries, chapels and churches on the western banks of the river, and located over the Green Line, is still mined and booby-trapped, often preventing thousands from visiting there each year. 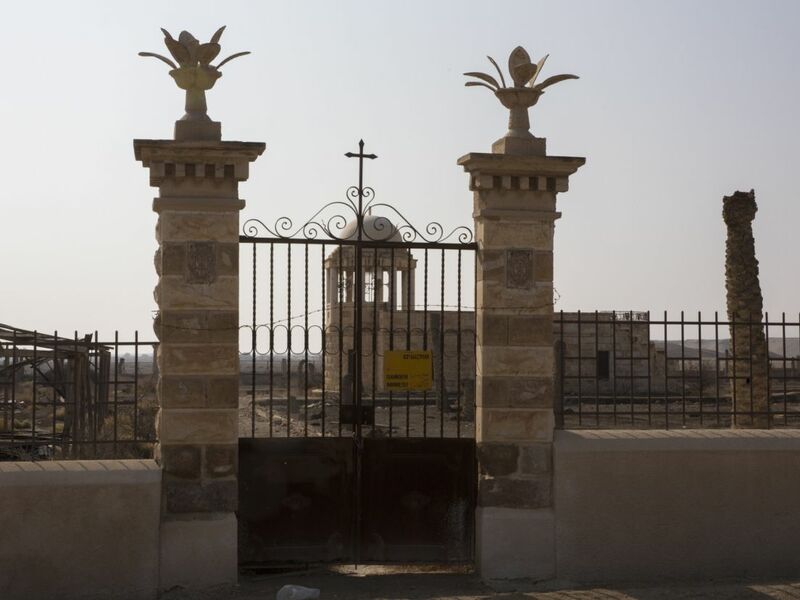 Visitors to the site, which reopened seven years ago after it had been closed for more than 40 years, can only take one route: leading from the Greek Orthodox St. John the Baptist Monastery to the Jordan. They are not allowed to deviate: Both sides of the road and the area in general are marked as containing minefields. The proximity to Israel’s border with Jordan, the fear of infiltrators and a lack of understanding of the importance of the site to pilgrims led to extensive mining of the area after the 1967 Six-Day War. The current estimate is that there are 4,000 mines in the vicinity; most are anti-tank, a minority are anti-personnel mines. All of them were laid by the IDF and have become obsolete in the past 50 years. In addition there are rumors that some of the monasteries themselves have been booby-trapped in sophisticated ways in order to prevent entry into them. In 1968 Qasr el-Yahud was closed and entry was totally prohibited. 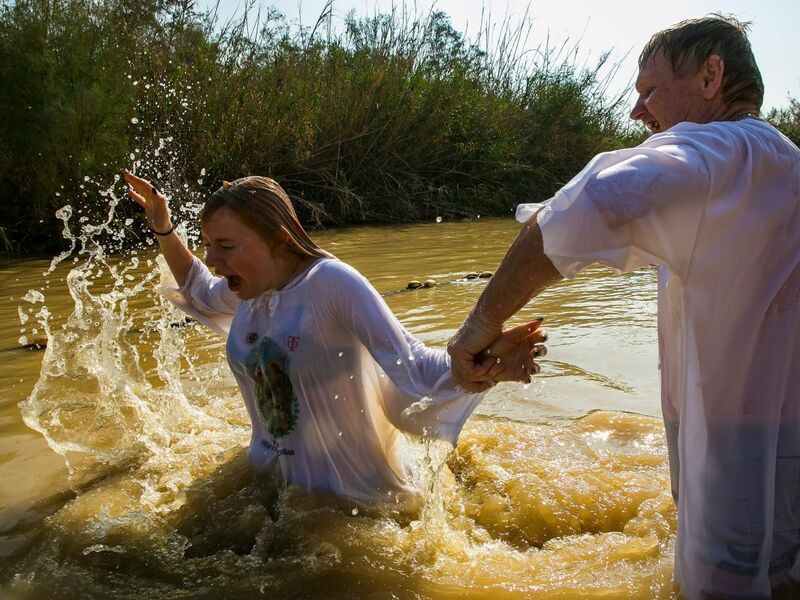 Only in 2011 was the baptism site on the riverbank opened in its current form: as an enclave within a closed military zone, under the management of the Israel Nature and Parks Authority. 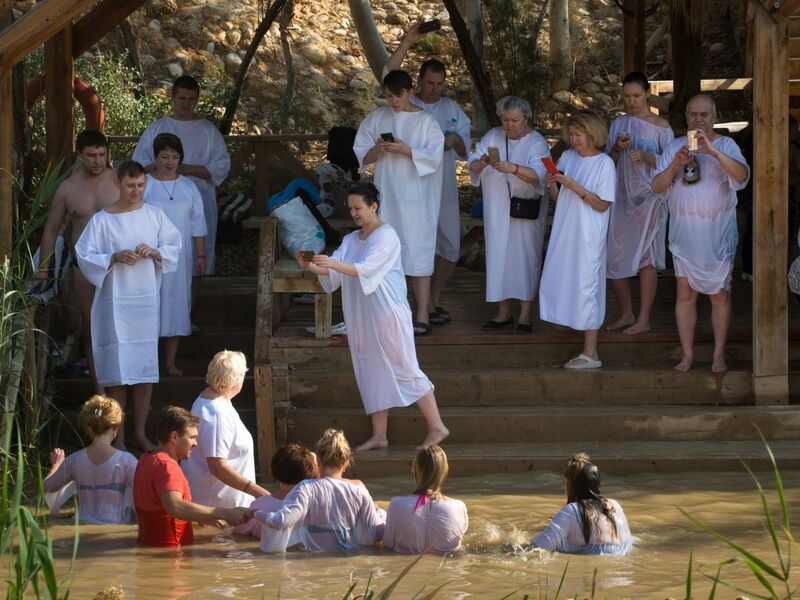 As per tradition, believers immerse themselves in the river on this holiday at the precise location where John the Baptist immersed Jesus, as described in the gospels of Matthew, Mark and Luke. After the crucifixion of Jesus, his baptism became one of the most significant events in the history of Christianity and this site is thus of great importance. 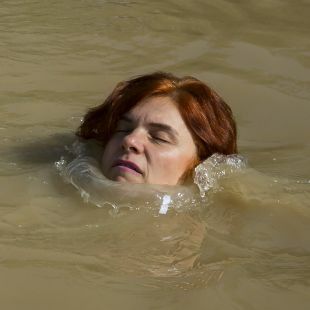 Some have even attributed curative powers to the water there. 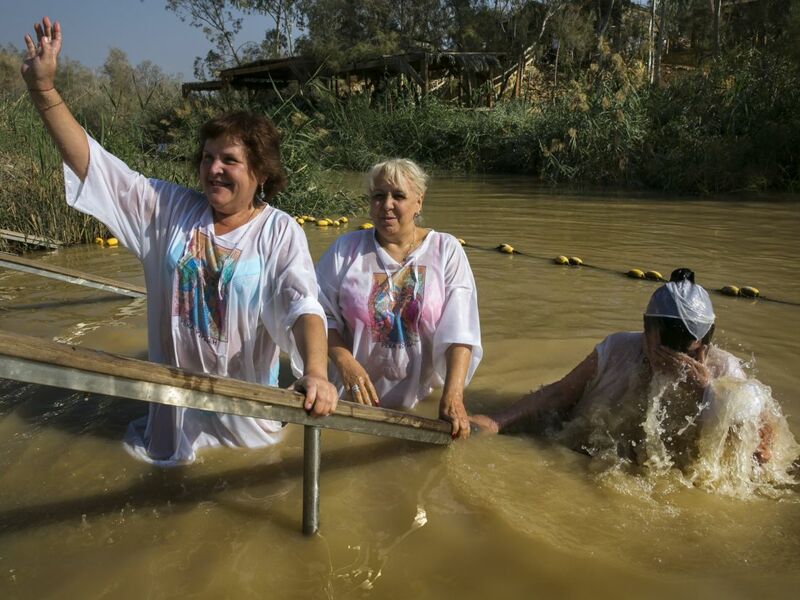 The name of the baptismal site, Qasr el-Yahud, reflects the perception, according to Jewish tradition, that this is also the place where the Children of Israel crossed the Jordan during their Exodus from Egypt. The literal translation is “Castle of the Jews” but many claim that the words have been scrambled and actually mean the “fracture” or “break” of the Jews — the place where the river split open to enable safe passage. Arabs, incidentally, don’t call the site Qasr el-Yahud, but rather Al-Maghtas: the place of immersion. Jewish belief also holds that the site is where Elijah the Prophet ascended to heaven in a “chariot of fire” and where the prophet Elisha performed miracles. Catholics, especially the Palestinians among them, do not customarily dip themselves in the river but rather pray there and fill plastic bottles with the water. 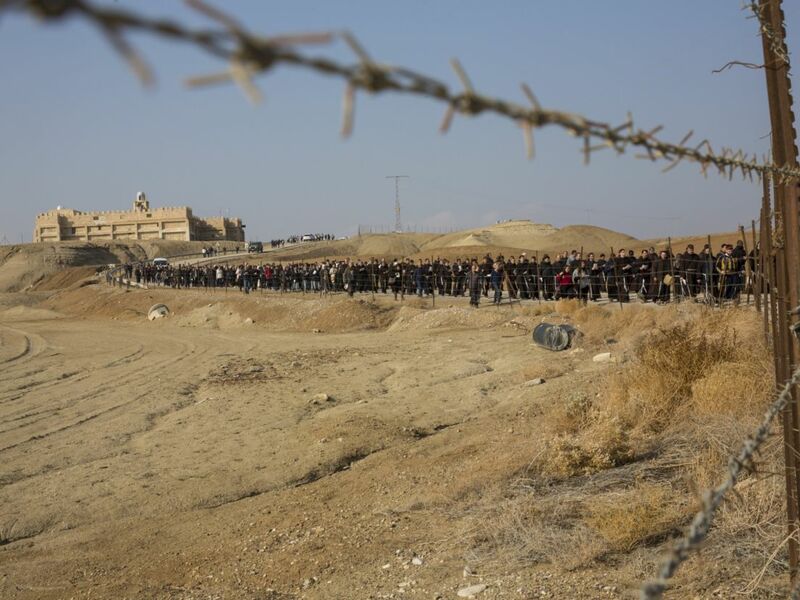 The hundreds of people who did enter the chilly Jordan on January 7 were Greek or Eastern Orthodox, many of them tourists from Russia, arriving on the same day the Roman Catholic Franciscans marked the Epiphany. 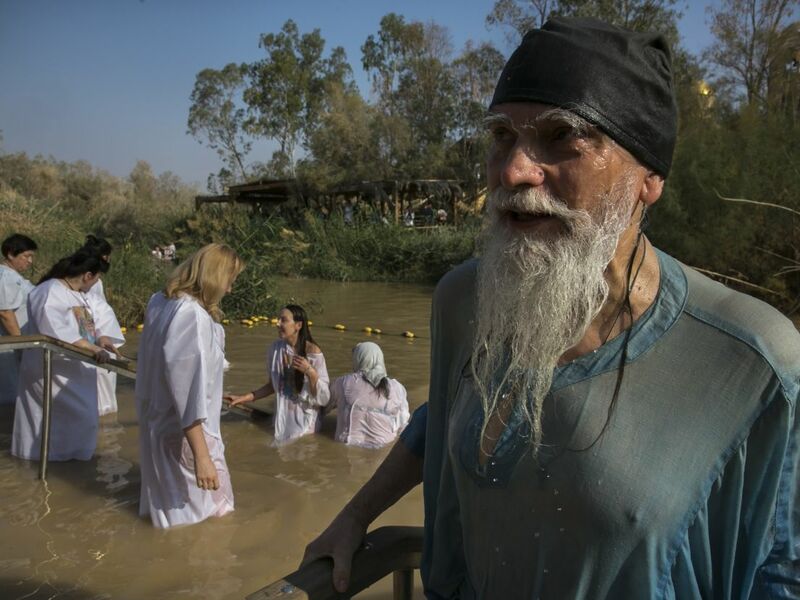 The masses of other pilgrims around them did not decrease the tremendous excitement of the Greek or Eastern Orthodox visitors one bit: Clad in white robes they had purchased for NIS 27 (about $8) at a local gift shop, they strode ceremoniously into the brownish water, praying and in many cases immersing themselves in it completely. The relative security quiet in this area and the general flourishing of Israel’s tourism industry both contributed to the record-breaking number of visitors to Qasr el-Yahud last year: 590,000. Moreover, the fact that there is no entry charge, in contrast to the competing site on the other bank in Jordan where tourists pay 12 dinars (about $17) for the visit – also helps in attracting many pilgrims. 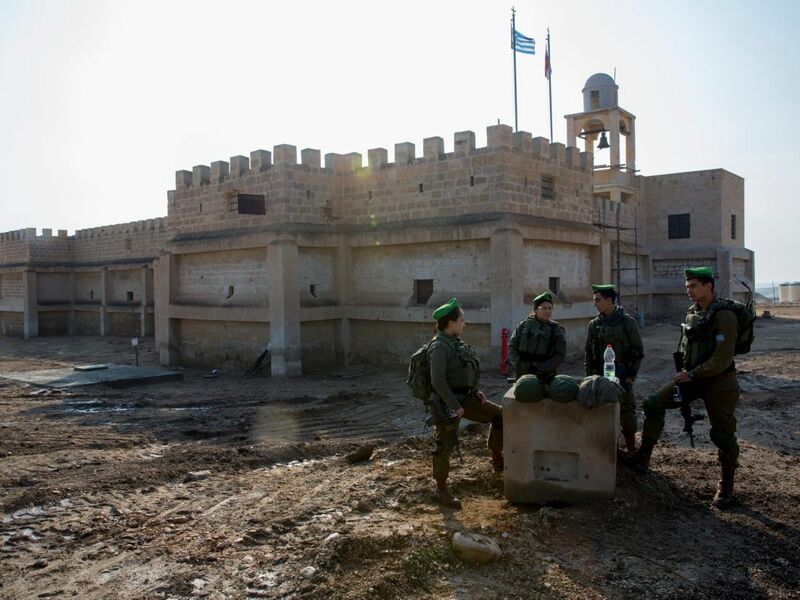 According to Lt. Col. Ghanem, Qasr el-Yahud is considered the third most important site in the region for Christian believers, after the Church of the Nativity in Bethlehem and the Church of the Holy Sepulchre in the Old City of Jerusalem. 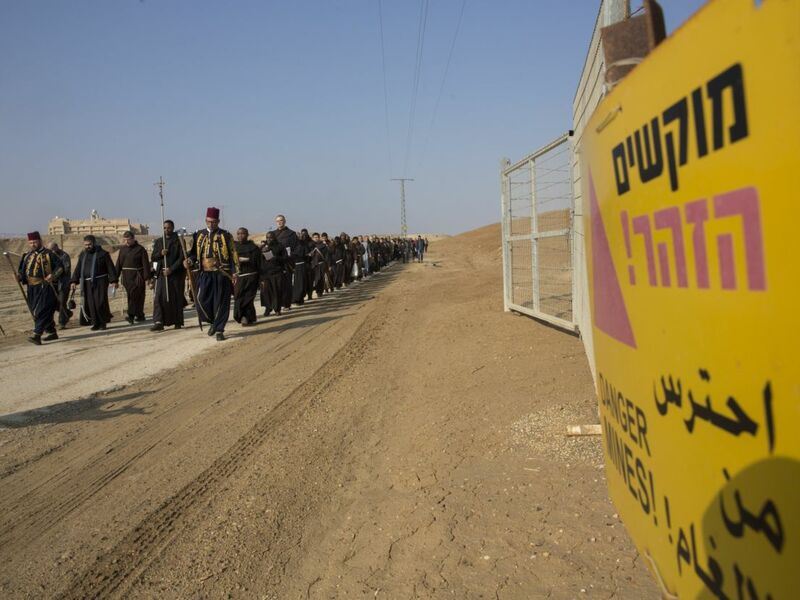 The IDF and the Civil Administration talk about the possibility of considerable investments in the vicinity, including connections to the regional electricity and water grids, but they know very well that the major obstacle to the development of Qasr el-Yahud – the land mines in the vicinity – has yet to be addressed properly. The seven monasteries and other structures in the vicinity of Qasr el-Yahud cover 1,000 dunams (approximately 250 acres), stretching over about a kilometer and a half (just under one mile), between Highway 90 and the river. The first monastery one reaches, at the junction of the road that descends to the baptism site itself, is the Monastery of St. John the Baptist. The structure was built on the foundations of the original Byzantine church at the site and it is the largest and most important of the Jordan River monasteries. The ancient structure was destroyed in an earthquake in 1024. In the 12th century it was rebuilt by the Byzantine Emperor Manuel I Komemnos. Other buildings of note are located to the south of the monastery. The octagonal structure directly to the left is a Franciscan chapel that was built in 1958. 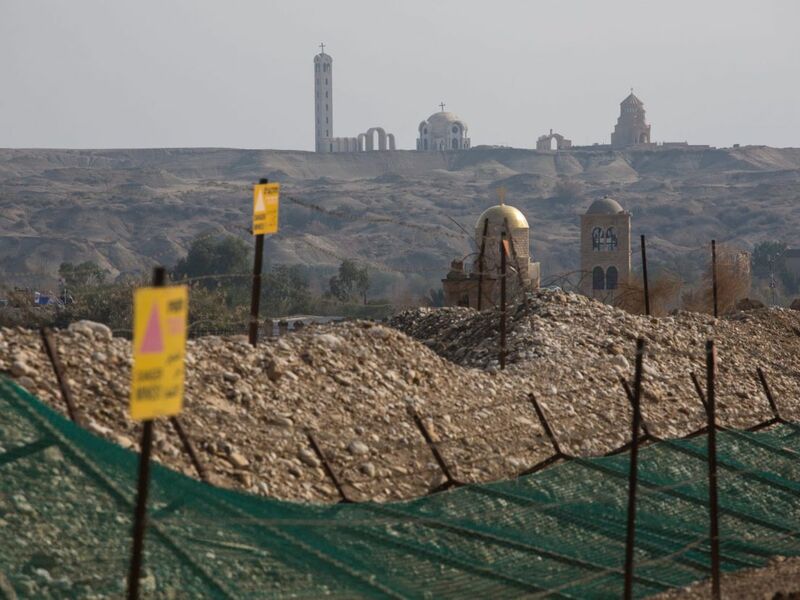 To the south, on the right side of the road, is a Syrian Orthodox monastery, which was mostly destroyed in an earthquake, and also a Coptic monastery consisting of two buildings erected in the 1940s. Further to the south, on the left-hand side, is the hexagonal-shaped Russian chapel and next to it, the smaller Chapel of the Bells. Some 200 meters (about 220 yards) along the way stands the Ethiopian Monastery of the Holy Trinity, flanked by a Romanian monastery with the green dome that was built in 1934. Across the way on the eastern bank of the Jordan, in the place identified as the biblical Beth Bara (Judges 7:24) stands a Greek Orthodox church with a gilded roof. Next to it is Tel Elijah, thought to be the exact place where Elijah ascended to heaven. In May 2016, The Wall Street Journal reported that the messiah was about to come to Qasr el-Yahud – or in other words, that an agreement had been reached to clear the mines near the site. The agreement was ostensibly reached at the time between the churches, the Israeli Ministry of Defense – which is responsible for what is called the Israeli National Mine Action Authority – and the Palestinian Authority. Yet nothing at all has happened on the ground since then. Not a single mine has been cleared from the area. Although the number of land mines is very large, the area of Qasr el-Yahud itself is about one square kilometer (about 250 acres). 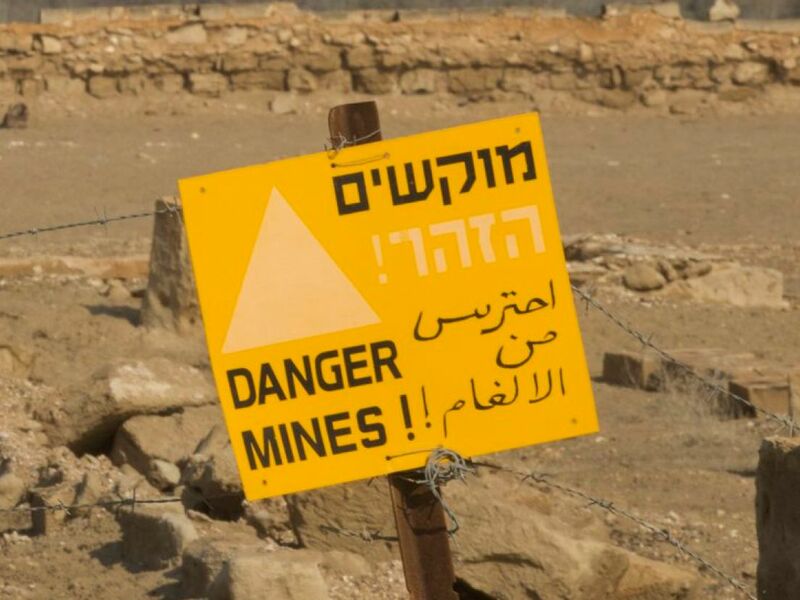 In rely to a recent query from Haaretz, Defense Ministry officials said optimistically that in the coming year all the mines will be cleared from the Qasr el-Yahud area. The work will be carried out by the Mine Action Authority and thereafter, according to supremely confident sources at the ministry, there will be safe access to all the monasteries in the vicinity. Hallelujah. 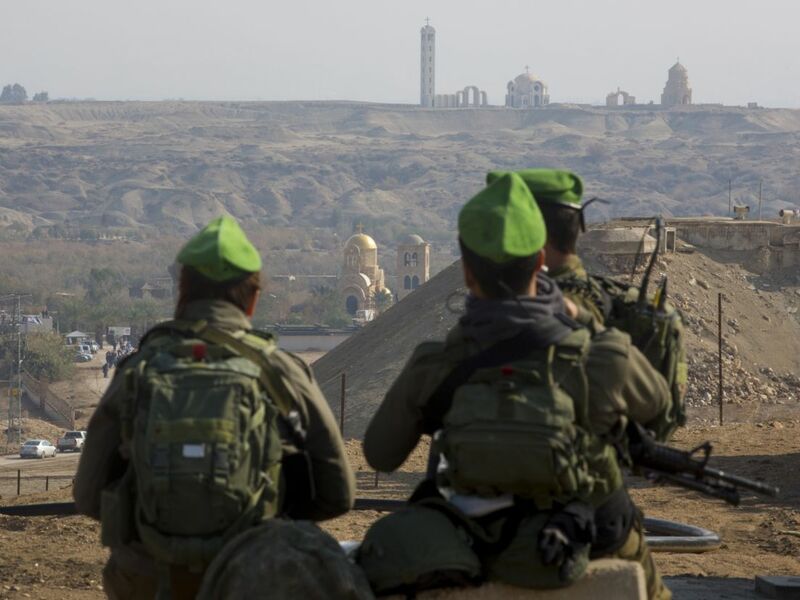 Judging by the past 50 years, however this optimistic Defense Ministry declaration will face a tough reality check in the coming year, at a junction where the Palestinian Authority, the different branches of Christianity and the State of Israel meet. Lt. Col. Ghanem clarified in the Haaretz interview that Israel’s intention, ultimately, is to reopen all the chapels and monasteries to those seeking to worship there; each of the denominations in question will be responsible for their respective structures. In addition the status of the greater Qasr-el Yahud are will not change: It will continue to be an enclave, subject to the restrictions of a closed military zone, and administered by the army, the Civil Administration and the parks authority. Prof. Noga Collins-Kreiner of the University of Haifa believes that the underlying problem at these sites is Tourism Ministry policy. She says the state is not investing enough in Christian tourism and prefers urban- or seaside-oriented tourism. Moreover, she says, the state is in general not investing enough in outlying areas and Qasr el-Yahud is certainly a peripheral area – a Christian site in a somewhat remote, desert location, right on Israel’s border and abutting PA land in Jericho. “The government,” says Collins-Kreiner, “helps the strong – Tel Aviv and Jerusalem.” The data she has collected shows a continuing decline in religious Christian tourism to Israel. In the past, about a third of the tourists visiting the country were Christian pilgrims. Currently they account for only about 20 percent. Paul stares at me as though he has seen an alien from outer space, and smiles. Then he wishes me a happy holiday and goes off to make sure his children don’t jump into the water.